Our company is an advocate and leader in the awareness and treatment of Skin Cancer; therefore, we encourage all our patients to schedule yearly full body exams. As the Memorial Day holiday weekend nears, people are gearing up to head outside for fun in the summer sun. But the sun’s rays can be harmful and it is important that people use skin protection when they spend time outdoors. Nowadays, Sue Peasley stays out of the sun, but for more than 20 years, she couldn’t get enough of it. Between the sun and the tanning bed, Peasley got her fair share of rays. “Probably, usually once a week. Once a week, unless I was going on a vacation and wanted to get that base tan,” said Peasley. Early Detection Can Save Your Life! 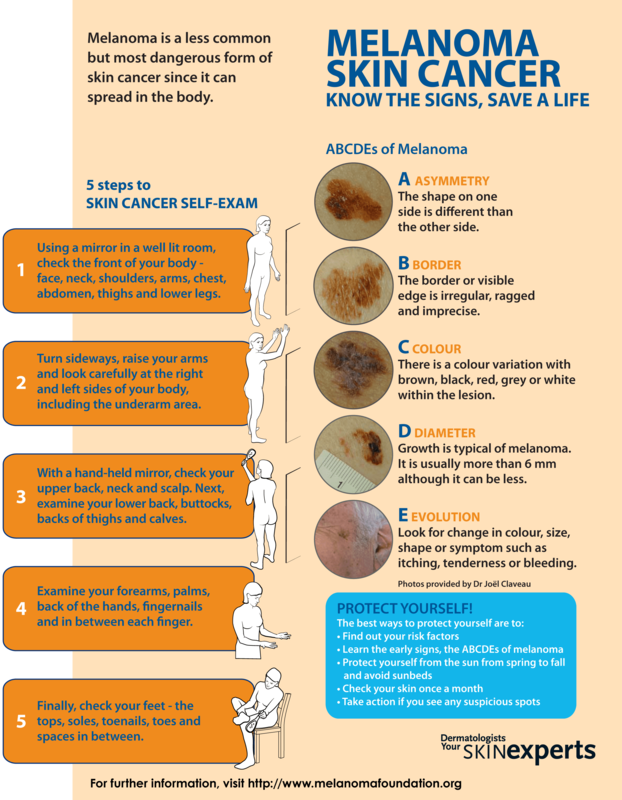 Since skin cancer is so prevalent today, we recommend that everyone learn how to recognize the signs of skin cancer, use this knowledge to perform regular examinations of their skin, and see your dermatologist annually (more frequently if at high risk) for a full body exam. Skin cancer is the most common form of cancer in the United States. One million new cases are diagnosed every year. Melanoma, the third most common skin cancer, is the most dangerous. However, with early detection and proper treatment Melanoma has a high cure rate. Sunscreen with sun protective factor (SPF) 15 or higher, and both UVA and UVB protection. (Consult your dermatologist regarding the ingredients of your sunscreen). All sunscreens are not created equal. The ingredients are more protective than an increased SPF product. Cancer cases have increased for those individuals who occasionally visit tanning salons! If you want to look like you’ve been in the sun, consider using a sunless self-tanning product, but continue to use sunscreen with it. Don’t forget your ears, nose, neck, hands, and toes. Many skin cancers develop in these areas. Protect your lips, another high-risk area, with lip balm that offers sun protection with an SPF of 30 or higher. Sunscreen should not be used to prolong sun exposure. Some UV light gets through sunscreen. Sunscreens should be applied to dry skin 15-30 minutes before going outdoors, and reapplied approximately every two hours. Be sure to reapply sunscreen after being in water or sweating. Remember: Sunscreen does NOT make sunbathing safe.